When visiting Boracay, you might want to try not limiting yourself to lounging on the beach the whole day. There are so many activities on offer it’s not hard to find something to do. Some of the most popular water sport activities on the island are jetskiing, parasailing, flyfishing, paraw sailing, and banana boat riding. It will be easy for you to arrange such activities as there are many island activity organizers on white beach who can help you. Perhaps the most popular activity of all is Boracay island hopping, which is a great way to spend half your day. 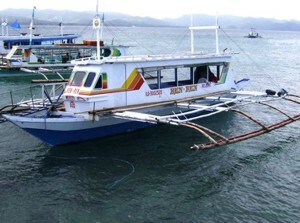 The motorized boats, or bankas, can accommodate anywhere from 2-30 persons. First off, they take you snorkeling at Crocodile Island, which is about 15 minutes away from Boracay Island. Here you can explore marine life through the clear blue waters. They can provide you with your snorkeling gear for a minimal fee. Next, they take you to Crystal Cove, an island which boasts of 2 caves that you can climb down to, each one opening right up to the ocean. The island itself is also fun for trekking and has a restaurant in case you get hungry while island hopping. Then for your last stop, they take you back to Boracay to a secluded beach known as Puka Shell Beach. You can choose to swim in this private cove or go shopping for souvenirs, jewelry and trinkets made mainly of Puka shells. Most of the items sold here cannot be found on white beach. If you haven’t done Boracay island hopping before, make sure that you have time on your next visit for this activity. Your vacation will surely be more memorable because of it.